ANDERSEN HITCHES - The Topper Shop Inc. When it comes to the best quality in trailer hitches and towing products, most people think Andersen Hitches. Here at Andersen, we’ve been selling quality, American-made products for over 50 years. Our family-owned, US-based company is headquartered in Idaho Falls, Idaho, USA. Andersen Hitches currently serves the towing industry with a complete line of popular trailer hitches and unique towing products for trailers and 5th wheels. We are proud of our simple, unmatched engineering designs, quality trailer hitch products, and friendly customer service. 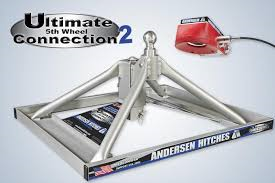 THE ANDERSEN ULTIMATE 5TH WHEEL CONNECTION 2 ATTACHES TO YOUR FACTORY PUCK SYSTEM OR UNDERBED GOOSENECK BALL!! IT ALLOWS YOU TO USE YOUR GOOSENECK BALL FOR A 5TH WHEEL TRAILER. THE ANDERSEN ULTIMATE 5TH WHEEL CONNECTION RAIL MOUNT CONNECTS TO THE RAIL SYSTEM. IT CAN BE USED AS A GOOSENECK OR A 5TH WHEEL CONNECTION.